The Unison Local Government branch banner was unfurled at the national demonstration at Sussex University on 25th March to support students occupying in protest at plans to privatise support services on campus. The university management has announced its intention to hand over services to a private company with no consultation with the staff affected – around 230 of them. 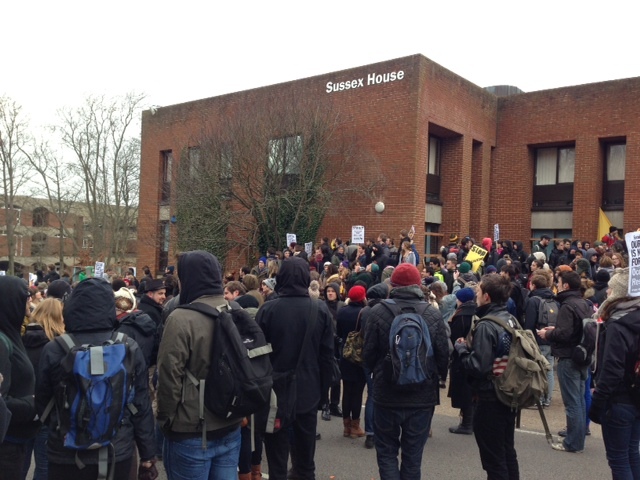 The students occupied the top floor of Bramber House in early February. After a lively demo attended by around 2,000 people they returned to the occupation with an even bigger group of protesters. Many of the threatened staff are Unison members, and nationally the union opposes the privatisation of jobs as it inevitably leads to worsening pay and conditions. The occupation has now been broken up by the police and university management, but the fight goes on!